One Earth. It’s all we have. We, the Wisconsin Union team, always aim to do our part to help preserve our incredible planet for future generations. For us, that commitment includes many sustainability initiatives one of which was a research-based art display that debuted at Union South in October 2017. For this newest initiative that combines both art and science, students from the Department of Life Sciences Communications (LSC) at the University of Wisconsin-Madison in collaboration with the Office of Sustainability and the Wisconsin Union sorted through and analyzed five bags of recycling and two bags of trash at Union South. This research effort also included conducting in-person observations of waste disposal practices, one-on-one customer interviews at Union South and a survey to determine typical waste behaviors. 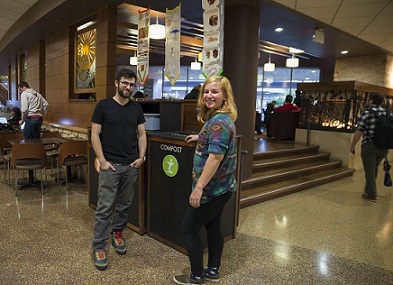 The goal of this collaborative effort was to study the Wisconsin Union’s waste stream, which refers to the lifecycle of waste from its creation to when it is thrown away. This can include objects being recycled into new materials or being discarded in a landfill. Students found that almost 50 percent of the trash bags’ weight came from items that were recyclable. Items that are recyclable but were discarded into trash bins included plastic straws, paper coffee cups, plastic silverware, mixed paper and more. When waste is disposed of improperly, too much trash in compost bins, for example, the entire bin cannot be processed properly and goes, instead, to a landfill. Though improper waste disposal is an issue, most students reported that they care about proper waste disposal and would like to do so in an environmentally friendly manner. Despite this, when asked to sort items used at Union South into the bins they thought was right, less than 50 percent of students chose the correct bins for the items. 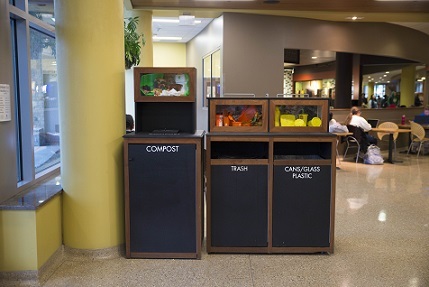 In general, students reported that composting was not as important as recycling, perhaps because many students weren’t aware of composting as an option. The main reason students reported improper waste disposal was simply a lack of knowledge. The second reason for improper disposal was lack of time. Students reported that they did not have enough time to figure out what items belong in which bin. A number of students reported that the most helpful solution to this issue would be to have indicators on the actual products, such as to-go boxes and coffee cups, which would provide disposal information or indicators. Another recommended way to increase proper waste disposal was to place signs or photos above bins denoting what can be disposed of in each as well as keeping bins throughout the building uniform to avoid confusion. After determining the issues and potential solutions surrounding waste disposal at Union South, the students in the class called LSC 515 “Public Information Campaigns and Programs” began formulating ideas about how to execute a project to solve waste stream issues. This waste project had both psychological and behavioral goals, such as motivating students to dispose of waste in proper ways and reducing the contamination of waste streams at Union South. “We are looking to improve the recycling and composting practices among students at Union South,” stated LSC 515’s Clean the Stream campaign. In order to start achieving this goal, artists Hannah Best and Anderson Ruppa paired up to create a collaborative set of visuals to help Union South members and guests dispose of waste properly. “As artists, our goal was to design language to communicate and bring attention to these issues, while at the same time using art to energize a public space,” said the artists in a collective statement. Two art pieces were chosen to direct waste disposal in the right direction, both of which display commonly misplaced items. One design features shadow boxes displaying the objects and the other is a set of arrows with the objects sealed inside. Both models respond to students’ suggestions to place informational content above the bins that tell them in which bin to dispose of their waste. To learn more about the Wisconsin Union’s sustainability initiatives, please visit union.wisc.edu/sustainability.